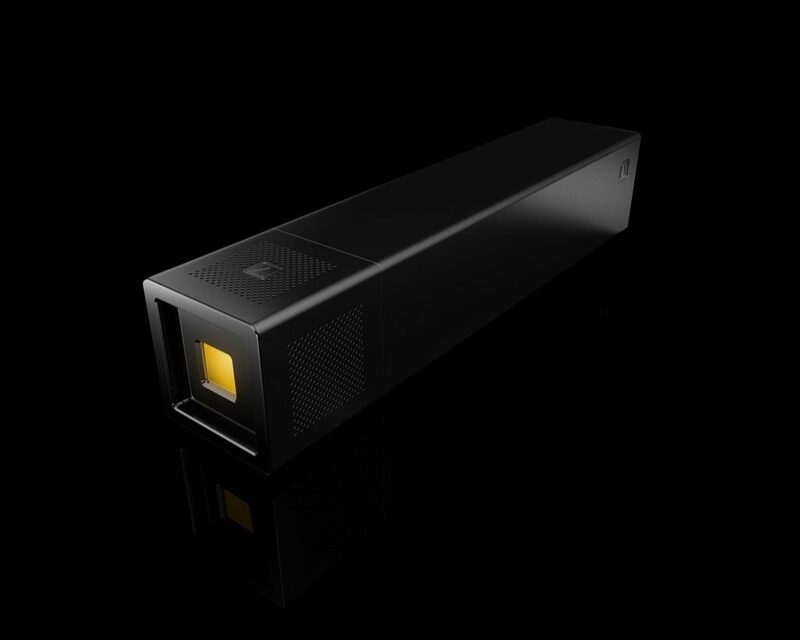 Anthem One has introduced a new LED lighting solution, using technology that will make “existing industrial-grade lighting obsolete.” The innovative modular system features a 30,000 lumen beam in a compact form factor, using its Anthem Light Cards as light fields in applications including photography and cinematography. The thin, interchangeable Light Cards are solid-state wafers featuring an array of micro LEDs and last up to 50,000 hours, according to Anthem One. They’re available in a range of frequencies, including UV and several types of visible light. Anthem One’s inventor, Justin Evans, began his career in filmmaking and cinematography, investing six years in the development of the lighting system, which looks to improve on comparable HMI lighting solutions. The compact Anthem One measures 5.5 inches square and weighs 7.6 pounds. The inclusion of neodymium magnets means multiples of the units can be attached into an array. It supports a variety of accessories, including lenses, speed ring adapters, stabilizers, rails and tracks, with more to come, and can be mounted to bikes, cars and drones. The system uses a universal 110v/220v power supply called Anthem Power, or Anthem Power Plus, a patent-pending “computer-controlled lithium-ion battery that reroutes voltage around misperforming cells to rebalance its output on-the-fly.” Anthem says the battery can last for decades with proper care. The Anthem One is priced at $1,499, and is available on the Anthem One website, along with the Anthem Power, Anthem Power Plus, six Anthem Light Cards and five Anthem Accessories. Anthem One stands to disrupt a century-old industry with wafer-thin Light Cards, high-tech matrix batteries and a host of accessories. MILWAUKEE, November 28th, 2017 – Anthem One is a groundbreaking LED technology making existing industrial-grade lighting obsolete. 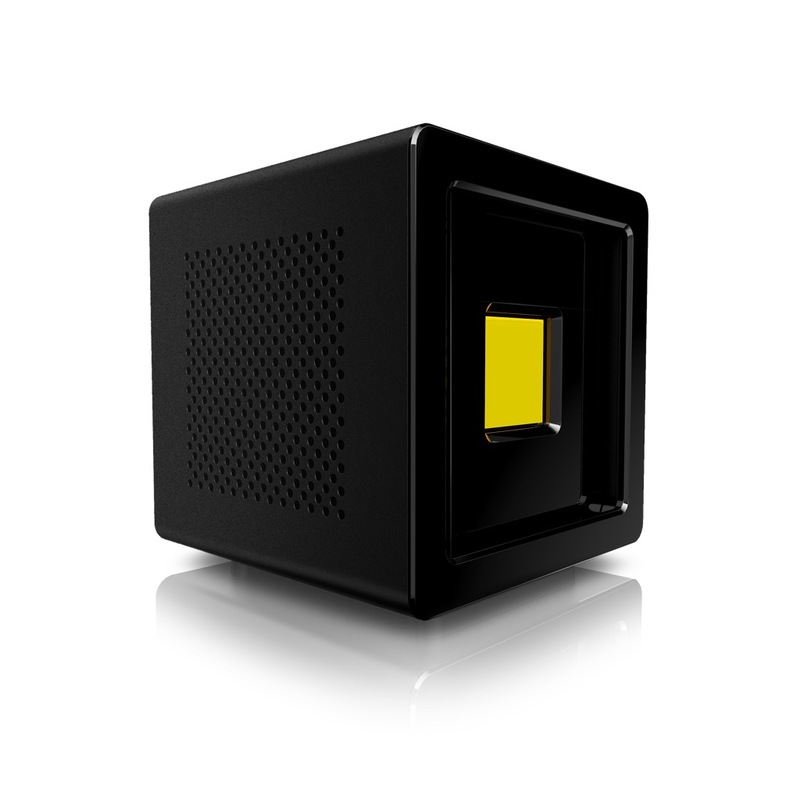 Anthem One uses Anthem Light Cards; swappable, tough, solid-state wafers coated with an array of micro LEDs. Each Anthem Light Card is as thin as a credit card and last up to 50,000 hours. Anthem Light Cards are available in a wide variety of frequencies including UV, broad spectrum agriculture, military grade IR and several types of visible light. The interchangeability of Anthem Light Cards makes them ideal for over 25 markets including motion pictures, military, security, outdoor events, agriculture and mining. Anthem One is a 5.5” (140mm) cube weighing 7.6 lbs. (3.5 kg). Anthem One’s sleek exterior hides an array of neodymium magnets which allow users to snap it to steel beams or assemble multiple Anthem Ones into an array. Each unit is silently and actively cooled. A variety of accessories mount to Anthem One via its hidden magnets, Kensington lock ports or ¼-20 threaded bottom-socket. “Anthem One is brighter, smaller, half the weight and lasts 2,000 times longer than our nearest competitor. For half the price or less,” says Adrian Ruddock, Anthem One’s Vice President. “And that’s important because price is the ultimate disruption. Who cares about cutting edge technology if the price makes it out of reach?” says Justin Eugene Evans. Anthem One is operated by Anthem Power, a universal 110v/220v power supply, or Anthem Power Plus, a patent-pending, computer-controlled lithium-ion battery that reroutes voltage around misperforming cells to rebalance its output on-the-fly. “Our battery is built around a Matrix Circuit. Cells can be rerouted and reconfigured in real time to create a new series or parallel circuit. In addition, it’s the only repairable battery system in the world. With proper care, the system can last for decades.” says Justin Eugene Evans. A range of accessories enable users to control and modify Anthem One’s light field even further. “Our first accessories focus primarily on the media industries. Lenses, speed ring adapters, doors & arms allow media professionals to use Anthem One in a manner to which they are already accustomed. Our next wave of accessories includes architectural and industrial applications.” says Adrian Ruddock. “Most importantly, Anthem One can be purchased today. We don’t need crowdfunding. It isn’t vaporware. There’s no Kickstarter campaign requiring you to wait for years. Order it on our website today and Anthem One will be at your door in 7-10 weeks.” says Rubén Burgos, Anthem’s Director of Customer Service. Anthem One retails for $1499, roughly 1/4th the cost of a comparable HMI (metal halide) lighting system. Combined with the extreme-longevity of Anthem Light Cards, customers will find Anthem One pays for itself in weeks or days. Currently, Anthem One, Anthem Power, Anthem Power Plus, six different Anthem Light Cards and five Anthem Accessories are available for purchase at the company’s website. Additional Anthem Light Cards and Anthem Accessories will be added to the product line. For complete technical details, visit the Anthem One Specs Page. For more information, pricing and to order, visit www.anthemone.com.